Friends of Calakmul (FOC) is a non-profit organization dedicated to the conservation of jaguars and their habitat, primarily focused on the Buffer Zone surrounding the Calakmul Biosphere Reserve in southern Mexico. Friends of Calakmul is formed by a small group of scientists and concerned citizens aware of the dangers faced by the tropical forests of Calakmul due to growing human pressures. Activities such as logging, illegal hunting and other such activities are being undertaken today. We are committed to reversing these activities and maintaining the long-term preservation of jaguars and their fragile ecosystem for generations to come. Conserve 350,000 acres of prime jaguar habitat in the Southwestern Buffer Zone of the Calakmul Biosphere Reserve. 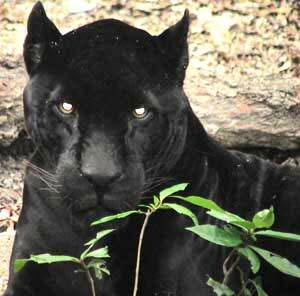 Protect jaguars and 60,000 other species of plants and animals. Support on-going research and monitoring on jaguar and bird ecology. Help local communities in and around the Calakmul Biosphere Reserve to benefit from jaguar conservation. Promote environmental education about the Calakmul Biosphere Reserve. Create a trust fund and identify sources of capital for long-term sustainable financing of newly protected areas in the CBR. The Core Zone of the Calakmul Biosphere Reserve is fully protected by the Mexican Government; i.e. all human activities are forbidden. However, this core zone comprises only 600,000 acres of the total 1.8 million-acre reserve. The remaining area, called the Buffer Zone, comprises the majority of the reserve and is still unprotected from logging and illegal hunting. The money from your donation is used to sign conservation contracts with community landowners, called ejidatarios, in the Buffer Zone. We offer landowners a better economic alternative than logging companies would have and these contracts are permanent. In this sense, we convert Buffer Zone land into de facto Core Zone as a way to increase long-term protection of the jaguars´ habitat. How can we prove that the land is being protected? We conduct yearly surveys to ensure compliance. Our partners are paid only after the survey proves no human disruption has taken place. 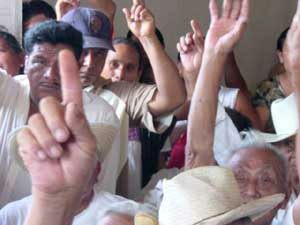 Local community landowners voting on signing a land-easement agreement with Friends of Calakmul. The Calakmul Alliance (of which FOC is part of) engages in educational activities at the local level to teach and reinforce how important preservation of their habitat is to the local culture, economy, and general well being. FOC is a partner in the Jaguar Project run by Unidos Para La Conservación (United for Conservation) through the participation of our co-founder Dr. Gerardo Ceballos. Brief bios of our founders, research team, legal team, friends and partners. Chief Biologist and Founder of Friends of Calakmul. Gerardo is one of the foremost ecologists and conservationists in Mexico. His outstanding career includes work in population and community ecology, biogeography, macroecology, and management, and conservation of vertebrates. He has published 80 scientific and popular papers and 15 books on endangered species, wildlife management, and reserve design. He is a professor at the Institute of Ecology of the National Autonomous University of Mexico (UNAM) and a member of the National Council for Protected Areas. He is currently on sabbatical in Stanford University, working with Dr. Paul Ehrlich. Co-founders of Friends of Calakmul and citizens of the world committed to habitat conservation. David and Sandra provided instrumental seed funding to initiate the project and raise funds on a continual basis in order to sustain the long-term viability of the Calakmul land trust. Sandra is an orthodontist with practices in Pacifica and Redwood City, California. David works in a high-tech firm in Silicon Valley. Sandra, who was born in Mexico City, came to the United States to obtain her Masters Degree in Orthodontics, whereupon she met David. They are now married and have two children, Ilan and Ariella. Legal Counsel of Friends of Calakmul. Alberto is one of the most renowned experts in environmental law in Mexico. He ensures the legality and the long-term security of the land conservation easements negotiated with local community landowners. Dr. Szekely's outstanding record includes the implementation of several major reserves in Mexico including the Monarch Butterfly Biosphere Reserve, the legal defense of the gray whale sanctuaries in the state of Baja California, and international agreements for the conservation of natural resources. He is an honorary member of the United Nations and represents Mexico on water use negotiations with the United States. negotiations with the US on water use rights. Donor relations for Friends of Calakmul. Lisa studied a BA in International Relations in the Universidad Nacional Autónoma de Mexico and a Master of Science in International Relations in Georgetown University with a specialization in International Development. Her work experience includes Regional Manager for Latin American financial institutions for The Advisory Board Company in Washington, DC; the creation of a network of Latin American microfinance institutions and U.S.-based multilateral and donor organizations in Consorcio Latinoamericano para Capacitación en Microfinanciamiento (COLCAMI) in Mexico City; Partner and Director of Government and Development Programs in ASISA, a Mexico City-based GIS solutions company. Asked why she chose to work for FOC she says "A small organization with practically no overhead and a focus on signing land-easement agreements per acre conserved is sure to stretch every dollar received to the max." Ximena studied International Relations at the Universidad Iberoamericana in Mexico City and has a very impressive résumé related to conservation: She has opened Sierra Madre stores (specializing in environmentally and socially-responsible products) in four beach resorts in Mexico; organized the First Unidos para la Conservación Photography of Mexico Contest along with World Wildlife Fund, Agrupación Sierra Madre and The Body Shop; founded and presently directs the National Association of Natural Private Reserves (of Mexico), ARENA; works as director of international cooperation of the Mexico-Guatemala-Belize Calakmul-Peten alliance; and collaborates with Dr. Gerardo Ceballos in several projects concerning the Calakmul rainforest. Cheri Sugal has worked in more than 25 countries with indigenous people, governments and local landowners, helping to create more than 100 million acres of new protected areas world-wide. In 2001, she helped create the one-hundred-million dollar Global Conservation Fund with funding from the Gordon and Betty Moore Foundation, for Conservation International in Washington, DC. In 2002, she became Executive Director of World Parks (www.worldparks.org), a non-profit brokering conservation deals with private landowners in areas identified as the last remaining habitats for the world's most critically endangered species (www.zeroextinction.org.). In addition to serving as Executive Director of Friends of Calakmul, Cheri is also currently an advisor to the Natural World Museum (www.naturalworldmuseum.org), the first museum in the world dedicated to educating the public about conservation, and a board member of Costa Rica Conservation Trust (www.conservecostarica.org), an organization helping to create sustainable practices in the central pacific valley of Costa Rica. Heliot studied Biology at National Autonomous University of Mexico (UNAM). His research has focused on management and conservation of mammals; specifically in the application of GIS and spatial analyses to environmental problem solving in terrestrial research and wildlife management. He has conducted research in southern Mexico, mainly in the tropical forests of Chiapas, Campeche, and Quintana Roo. For his Master’s thesis, Heliot worked on a Mexican jaguar project. His research determined the habitat use of jaguars in human-dominated landscape and modeled the suitability of habitat for this species in the Mayan forest in the southern Yucatan Peninsula. Currently, he is collaborating with Dr. Gerardo Ceballos in several research projects including a jaguar project in Calakmul. D&R Greenway Land Trust is central New Jersey's non-profit land preservation organization, founded in 1989 through the collaboration and vision of four organizations: the Stony Brook - Millstone Watershed Association, Friends of Princeton Open Space, Regional Planning Partnership, and the Delaware & Raritan Canal Commission. D&R Greenway permanently preserves watershed lands and large-scale landscapes, thereby preventing the loss of open space to development. Their operating region consists of over 1,500 square miles, encompassing portions of the Delaware, Raritan and Millstone River watersheds and the Delaware & Raritan Canal. This includes all of Mercer County and parts of Hunterdon, Somerset, Middlesex, Burlington and Monmouth counties. They have a staff of 6 full-time and 6 part-time professionals. Since 1989, D&R Greenway Land Trust has preserved 8,633.47 acres of land valued at over $179 million. They have preserved 153 different properties and serve as the continuing steward of 35 preserves and 46 conservation easements. Friends of Calakmul and D&R Greenway partnered in recognition of our shared objective to protect both summer and winter habitats for over 100 species of neotropical migratory birds which depend on both geographical areas for their species' survival. Specifically, there are some 65 neotropical migratory birds that winter in the Calakmul region, that use the Sourland mountains as their breeding habitat. A successful partnership will have broad potential impact as an international model for land preservation, education and stewardship that can be replicated by the 1,400 land trusts that currently exist in the U.S. Our initial project is to collaborate on funding and building a biological research station in Calakmul, Mexico that will support data collection on neotropical migrant birds. The Global Heritage Fund's mission is to enable successful long-term preservation of mankind's most important and imperiled Global Heritage cultural sites in developing countries with acute pressures and without resources for preservation and planned development. GHF is partnering with Friends of Calakmul to help preserve the archeological and biodiverse wealth of the Calakmul area. GHF is working on saving the archeological sites in Mirador Basin in Guatemala, this area is adjacent to Calakmul just across the border in Guatemala. FOC and GHF are pursuing a strategy of cross border cooperation. The Global Heritage Fund is a private, California non-profit organization based in the San Francisco Bay Area. www.globalheritagefund.org. David Leventhal. Founder and Board President, Friends of Calakmul. David Leventhal, Co-founders, Friends of Calakmul in the US and Amigos de Calakmul in Mexico. David is also co-founder of Dexterra, Inc. a venture funded mobile enterprise software company based in Seattle, WA.He leads their business development and manages resellers and other key partners. David had a similar role in the internet company Buzzsaw.com, which was a spin-off from Autodesk. His background is both in software and media having worked also with Home Box Office and Whittle Communication in various sales and marketing roles. As a co-founder of Friends of Calakmul, David set up the organizational infrastructure and much of its innovative use of technology including the web and ASP CRM solutions to acquire and manage a high level of members. Additionally, he raised the initial funding and established organizational structure. David lives in San Mateo, California with his wife Sandra and two children. David and Sandra are embarking on their next project, a sustainable and renewable resort development on 100 acres south of Zihatanejo, Mexico. Robert Levitan. Board Secretary, Friends of Calakmul. CEO & Founder. Flooz.com. Robert Levitan is co-founder and CEO of Flooz.com, the creator of the world's first on-line gift currency for consumers and businesses, sent by e-mail and accepted as a branded form of payment at the Web's best stores. Prior to founding Flooz.com, Levitan was a co-founder of iVillage.com and a consultant to America Online. At iVillage, Levitan was responsible for developing the company's innovative sponsorship sales strategies. Levitan created integrated online marketing programs for companies such as Kimberly Clark, MGM, Toyota, Starbucks, Johnson & Johnson, IBM, and Glaxo Wellcome. Levitan also created a new online publishing model with Intuit and Charles Schwab to launch a financial planning site for iVillage called the Armchair Millionaire. In recognition of his accomplishments in developing new online sponsorship models, Advertising Age proclaimed Levitan a "digital media master." Levitan served as President of iVillage's Better Health web where he formed a strategic relationship with Intel to develop new interactive health applications such as the Personal Health Report. Levitan serves on the Board of Directors of New York Cares, a service organization that coordinates volunteers who work with children, the homeless and the elderly in New York City. In 1997, Levitan and his two brothers climbed Mt. Kilimanjaro and visited CARE project sites in Africa as part of a fundraiser for CARE, the international relief organization. He is also a board member of HEAVEN, a non-profit organization providing youth with the technology training and tools they need to succeed and lead. Levitan graduated from Duke University with a B.A. in history and public policy studies. Levitan lives in New York City. Natan Zaidenweber. Board Treasurer, Friends of Calakmul. Mr. Zaidenweber is an industry expert in stakeholder engagement and triple bottom line reporting with over 10 years of relevant experience in the field of corporate social responsibility, working with companies like Royal Dutch Shell. He has over 9 years of entrepreneurial experience. Formerly a Director of a Multinational research project with The World Bank and The Mexican Government, he holds a Masters degree in international development policy from Stanford University. Bill is responsible for landowner negotiations and uses his naturalist expertise toward D&R Greenway Land Trust stewardship activities. Since 1980, Bill has owned and operated Hunterdon Turf Farm, a third generation family farm. He is currently working with his family on a permanent preservation plan, and can speak to landowners from their perspective. Bill is a founding trustee of the Hunterdon Land Trust Alliance, and served for 12 years as Chairman of the Kingwood Township Environmental Commission. Bill has been involved since 1995 in the South Branch Watershed Association Biological Water Monitoring Program and in 1997 received their Annual Conservation Award for work on conservation of the region's waterways. He has a BS in Marine Biology from Farleigh Dickinson University. Linda joined D&R Greenway Land Trust as Executive Director in July of 1997 and is responsible for major fundraising and land protection strategies, and for all facets of land trust management. She has over 20 years of experience managing multi-faceted nonprofit programs and structuring complex land preservation transactions. She has been active in the development of several projects that have achieved federal recognition and spearheaded the establishment of one of the first multi-million dollar county open space funds in southeastern Pennsylvania. Linda has collectively secured well over $100 million to support land preservation. Under Linda's leadership, D&R Greenway Land Trust has experienced phenomenal growth resulting in name recognition throughout the State and top dollars from the NJ Green Acres Program. Linda's vision and partnering abilities have led to formation of new initiatives and have resulted in leveraged funding and public/private partnerships. In June 2002 Linda was awarded the prestigious International Paper Conservation Partnership Award from The Conservation Fund, a national conservation organization, at the National Press Club in Washington D.C. Linda holds a BS in Environmental Planning from Rutgers University. Kevin Gottesman has bought, sold, written and produced advertising for twenty years, the last ten online. He is currently the Advertising Director for Donordigital where he plans and buys fundraising and advocacy campaigns online for clients like Earthjustice, Amnesty International, Humane Society the ACLU and many others. He has previously worked for Citysearch, SONY, 24/7 Media, eGroups, Lighthouse for the Blind, as well as Al Gore's and John Kerry's presidential campaigns. An alumnus of the University of North Carolina at Chapel Hill, he lives in San Francisco with his wife, Jennie Lee. He enjoys disc golf, tennis, guitar, travel and super shuffle mode on his iPod. Anne H. Ehrlich is a senior research scientist at Stanford; she has carried out research, taught courses on environmental policy, and written many articles on population, environmental protection, and environmental consequences of nuclear war. She has coauthored ten books, including The Stork and the Plow, Betrayal of Science and Reason, and One With Nineveh. She also served as a consultant to the White House Council on Environmental Quality's Global 2000 Report, a commissioner for the Greater London Area War Risk Study (GLAWARS), and on the boards of Friends of the Earth, the Rocky Mountain Biological Laboratory, the Ploughshares Fund, and the Sierra Club, among others. She currently serves on the boards of the Pacific Institute for Studies in Environment, Development, and Security and the New-Land Foundation. Before founding CSF, John established and managed Conservation International’s largest field program in Brazil, a successful effort to expand forest protection along the country’s Atlantic coast. He has conducted policy and economic assessments on such topics as forestry, cattle ranching, road development and biodiversity prospecting in a number of countries, including Brazil, Suriname, Guatemala, Bolivia and Papua New Guinea. Subsequent to his work at CI, he served as Policy Director for the Pacific Forest Trust, where he chaired the Forest Stewardship Council’s Pacific Coast Working Group. John is fluent in Portuguese and Spanish, speaks French and holds a Masters in Public Policy from Harvard University.